What is Drive By Wire Technology? Drive by Wire or simply 'DbW' is also known as the X-by-Wire. It is a semi-automatic, computer controlled technology mainly used in cars. It is quite similar to Ride by wire technology used in bikes. DbW controls the vehicular systems such as the acceleration, handling, braking, steering and other functions of a motor vehicle. It does so sans any physical/mechanical linkage. A conventional vehicle carries out these functions by either using mechanical, hydraulic or pneumatic components as the case may be. These components are prone to wear-and-tear. Hence, their performance & efficiency deteriorates over the period. And thus, they become inefficient. Drive by wire technology mainly uses electrical/electronic components such as sensors and/or actuators to control vehicular systems. This technology eliminates the need to use conventional components such as drive-belts, drive-shafts, pumps, vacuum boosters and master cylinders etc. Instead, it uses electric motors and electro-mechanical actuators to execute the functions carried out by the conventional mechanical/hydraulic components. 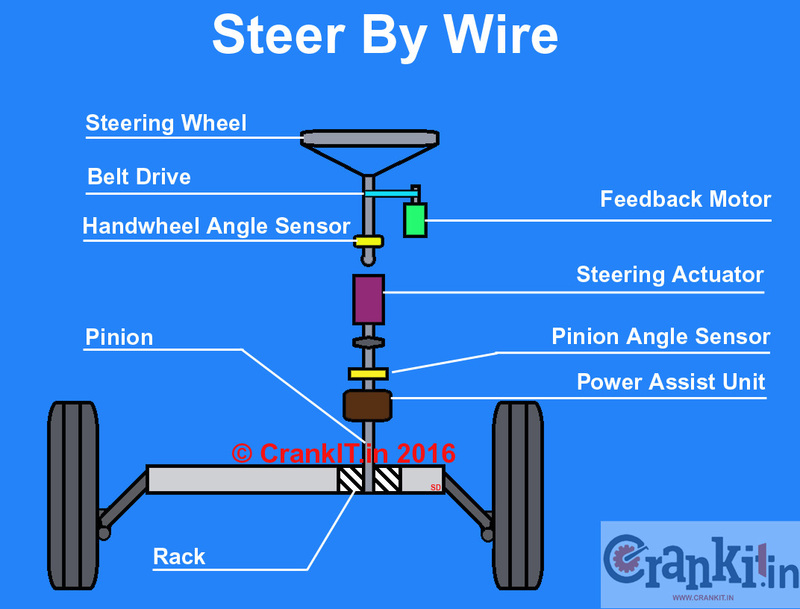 Which Drive by wire systems a vehicle uses? Moreover, these sub-systems have a dedicated ECU to control the sensors and actuators associated with them. The respective systems operate without any mechanical linkage. As a result, this technology is getting popular. Thus, it finds a place in the luxury segment or high-end vehicle models. Eliminates losses caused by mechanical linkages. Longer service intervals, i.e. decrease in visits for routine maintenance and other adjustments. Better accuracy. And hence, results in better fuel efficiency & lower emissions. Drive by wire system are costly to design and manufacture. Software failure may lead to malfunctioning of these systems. Error in calculation of required data may lead to an accident. Prone to hacking which may jeopardize the control of the vehicle. Many car manufacturers such as Mercedes-Benz, BMW, Land Rover, GM, Toyota, Volkswagen, and Nissan have implemented 'X by Wire' systems in their vehicles. However, this technology is still in development stage. And thus, it requires rigorous testing and validation. But, the future of automobile will rely heavily on this technology for better fuel efficiency and control emissions. 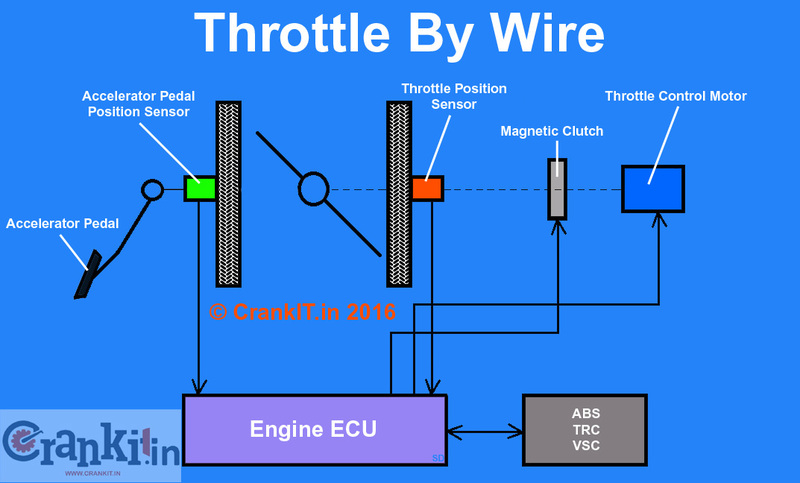 Home » Technical Anatomy » What is Drive By Wire Technology in cars and How it works? Know More. What is Hill Start Assist Technology in cars? What Is Motorcycle Traction Control & How It Works? What Is 4 Valve Technology And How It Works? What is a Sports Utility Vehicle or SUV? What Is Combi Brake System By Honda And How It Works?